VIDEO from football matches: part 1 (41 MB), part 2 (48 MB), part 3 (49 MB), part 4 (38 MB). 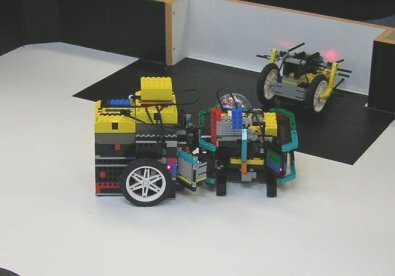 On Wednesday, March 8th 2006, contestants from about 20 primary and secondary schools from the whole Slovakia met in Stará Turá, in the areals of Joined secondary electrotechnical shool for two days, in order to compete in building and programming models built from robotic LEGO sets, robotic football (soccer), robotic rescue mission, and robotic dance. The event for prepared by Slovak Association of Electronics with support of Infovek and Ministry of Education. Many sacrified a beautiful winter sunny day and instead of the spring holidays or skiing concentration chose to come to the robotics contest. 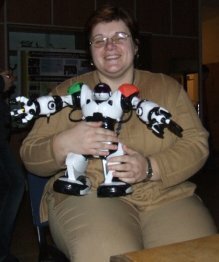 The participants were welcomed by two robots of the WowWee: family - RoboSapien and RoboPet. However, they were busy enough with their dance, football, and rescue robots to unwrap them, attach the fallen parts, test the programs, and interaction with new floor surface, tune sensor calibration for light conditions, and prepare for the building contest ready to start after the lunch. The more than four-hours long building contest was the first on the schedule. The holidays were sacrified also by the cooks, who prepared a festive lunch that was followed by an official opening of the contest with small break for folk culture. 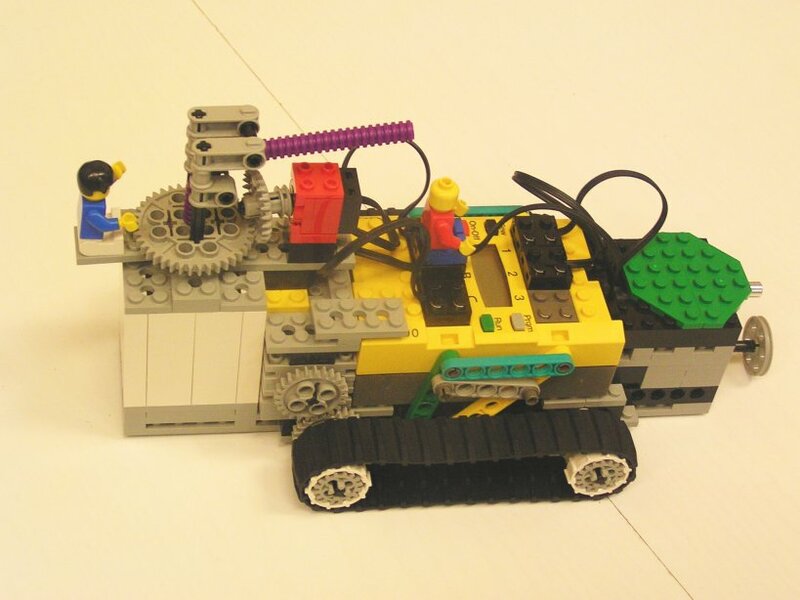 The contest was organized for the sixth time in this form, therefore the expectations were high: both the participants and the teachers have some LEGO building and programming history - including great Tutorials prepared by Infovek and Eduxe. For the first time, we could see usage of the new DCP sensors. The organizers were delighted by the number of participants, but they hope there will be even more next year! 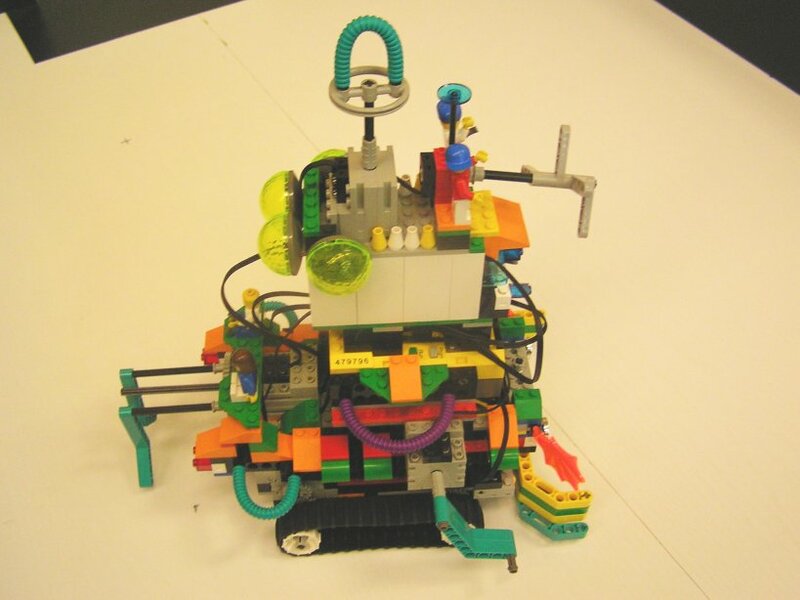 A dozen teams consisting typically of two members unwrapped their building sets and headed on to build a model just making use of their young and fresh creativity. 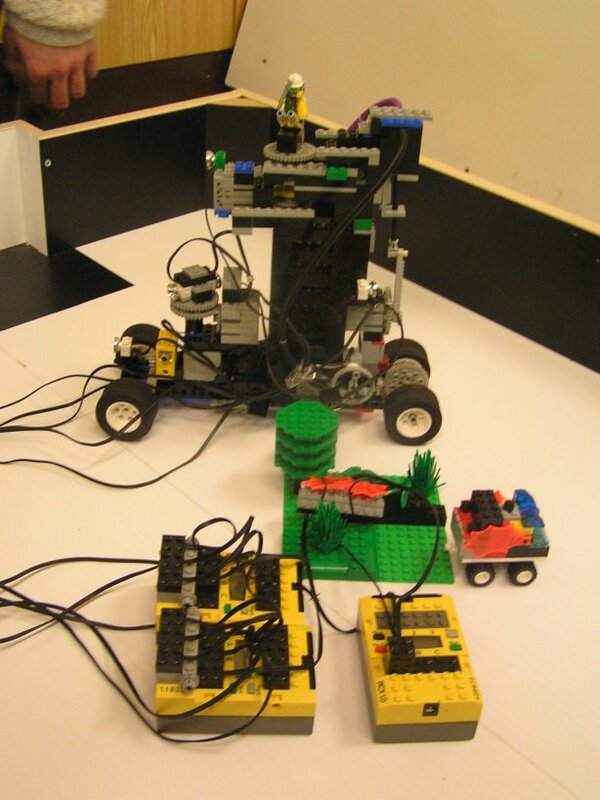 The goal of this category is to practice concentration during several hours and the team work on a specified project. The jury focuses mainly on the product functionality (and really, this year too, most of the models worked) and awards selected models for construction, programming, creativity, presentation, compactness, use of sensors and communication. The participants themselves decide the "public award" given to the team that receives most of their votes. 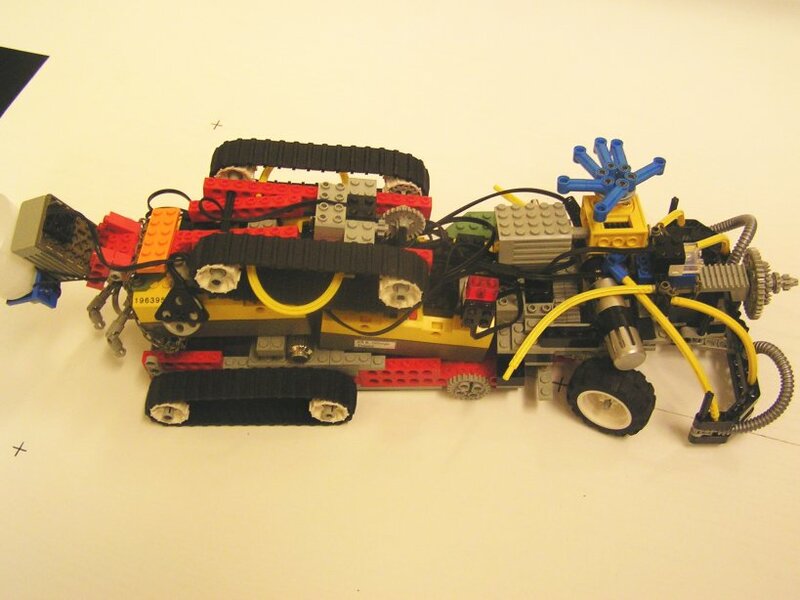 The task for this year "Natural calamity" was relevant to one of the main challenges for robotics. 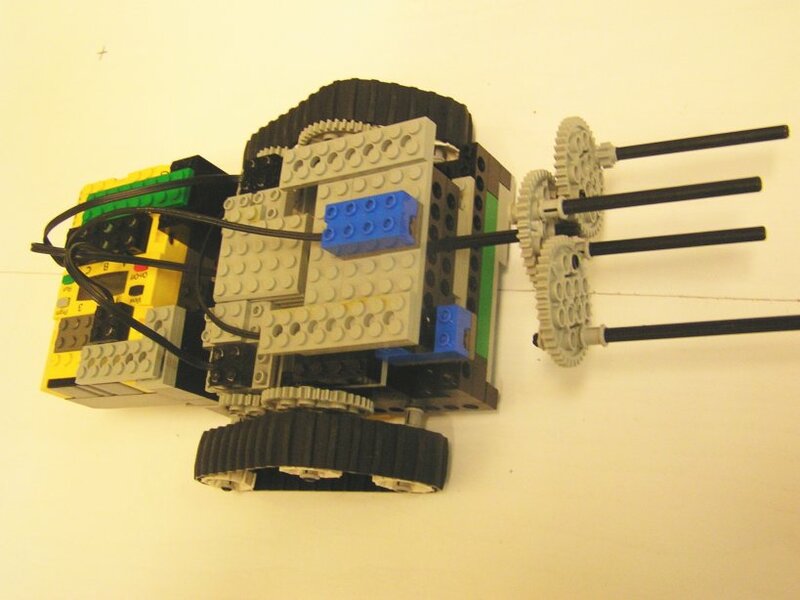 A model must be strong and stable, motors should be connected to the wheels or other moving parts using suitable gears, the sensors should be placed such that they provide meaningful input information. A completed model receives its "soul" after the program is written. 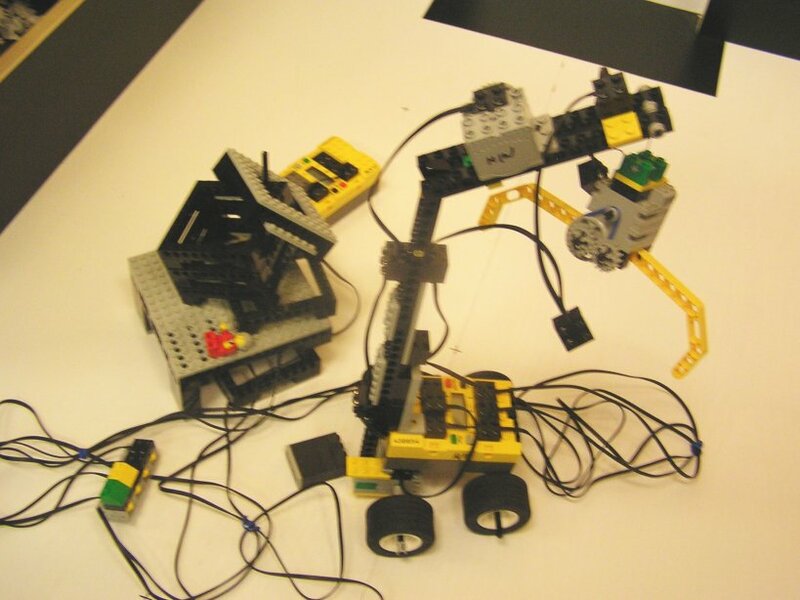 Most of the teams worked in the iconic programming environment RoboLab, where the program can perform several branches in parallel, and cosists of icons representing commands, branching, motor and sensor control. The links between the icons correspond to both the program and the data flow. 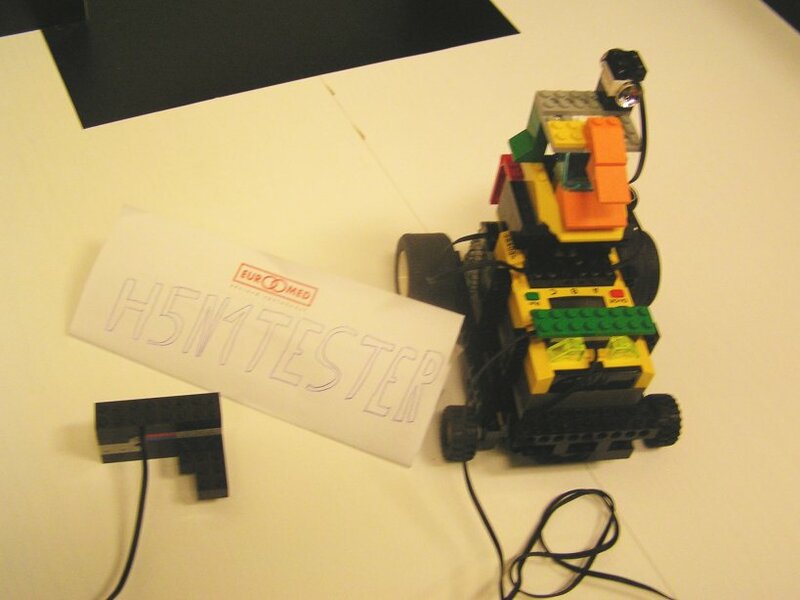 After an exhausting work, the contestants presented their products to other teams, spectators, and the jury, that awarded the best models by prizes (see below). 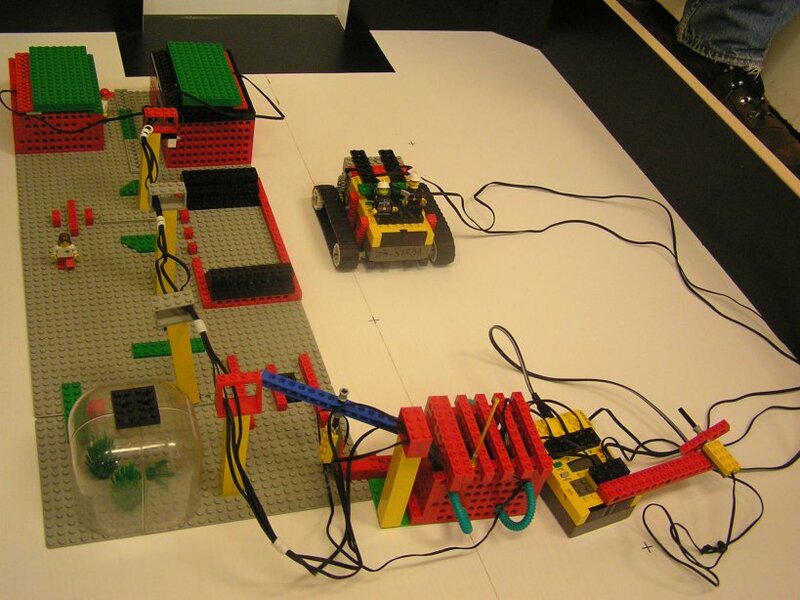 Several teams utilized cooperation of two or more programmable RCX bricks, which communicated with each other. This allowed to use more than three sensors or motors. 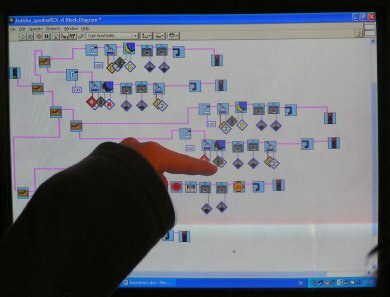 Some models were controlled by button interfaces connected by cables to input ports. The teams, which have built their programs gradually and soundly, and have tested them each time a new feature has been added, achieved even a complex and working programs. NB! aware the temptation to write large and complex program at once without testing after each step. In that way, you will almost sure achieve a state that nothing work and nobody will be able to figure out why... After all, some contestants experienced this on their own models. 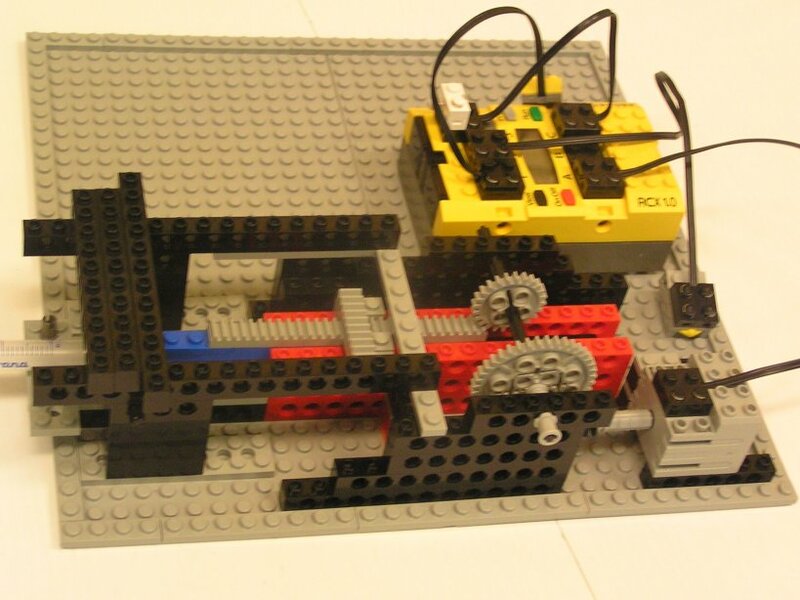 Please, start with small program pieces, test each of them, and only then attempt to connect them together into larger creations. The categories of RoboCup Jr. followed another day, giving the contestans more time to adjust to their robots to the local conditions and allow for more testing. The morning was dedicated to the football matches in categories one-on-one (4 teams) and two-on-two (3 teams). For the first time, all contestants were equipped with infra-red balls and sensors and thus there were no tennis-ball matches. 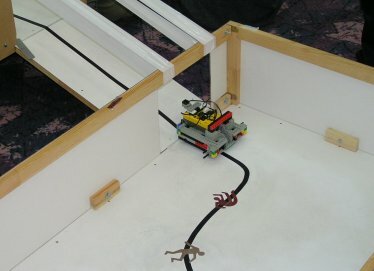 Most of the robots utilized compass sensors. As a result, the matches were really spectacular and full of tension. In the 1-on-1 tournament, each team played against each team one match. The number of victories (or draw games, but there were none) was the first criterium, followed by the mutual match result, and the total score difference, and higher number of goals given. The most appealing was the robot from Kosice, with a very effective dribbler and wooden circular base with a small openning for leading the ball. The only disadvantage was its slower speed, otherwise it was able to reliably detect, conquer and move the ball around the playground and shoot goals. The total score of the team speaks for it all: Kosice gave 10 goals and received only one, smoothly winning all the matches. In two-on-two tournament, the Povazan team was the more lucky one. 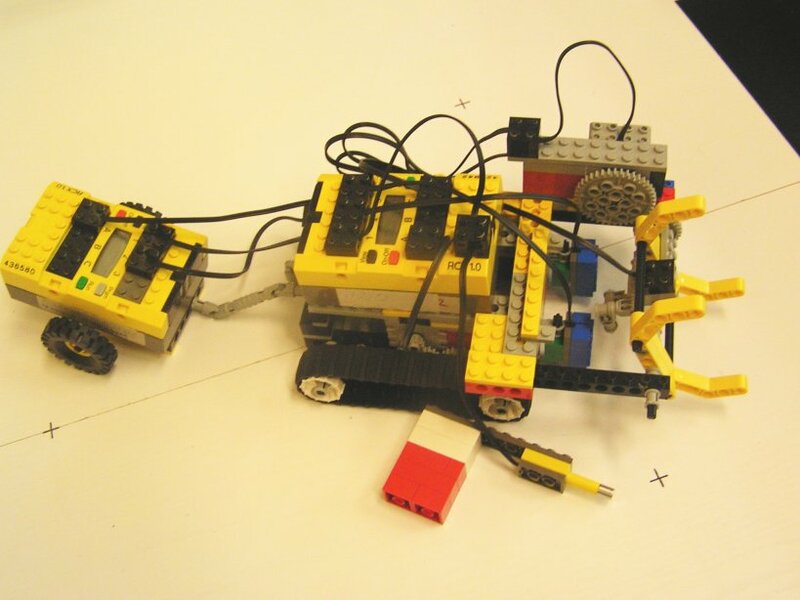 In general, the LEGO robots often broke appart, some programs didn't do what they were supposed to, but the spectators had definitely lots of fun! (video will be published some weeks later). 8 competing teams participated in the Dance contest. The dances in the duration of 1-2 minutes were beautiful and funny. We could all see that the teams spent many hours and efforts preparing their performances. The robots had pretty costumes. One useful tool came from the ŠVŠ Banská Bystrica club, which allowed to generate an NQC program based on the rythm pressed on the keyboard. More informations including the team presenation is available here. We were lucky to copy presentations also from the teams ZŠ Rudolfa Dilonga, Trstená (powerpoint, 6.5MB), ZŠ Považská Bystrica (powerpoint, 1.8 MB) and ZŠ Hradná, Liptovský Hrádok (pdf, 117kb). The organizers will have to prepare the dancing stage somewhat better for the next year (even though the robot detours in the direction of jury made it dance too for the lack of space). 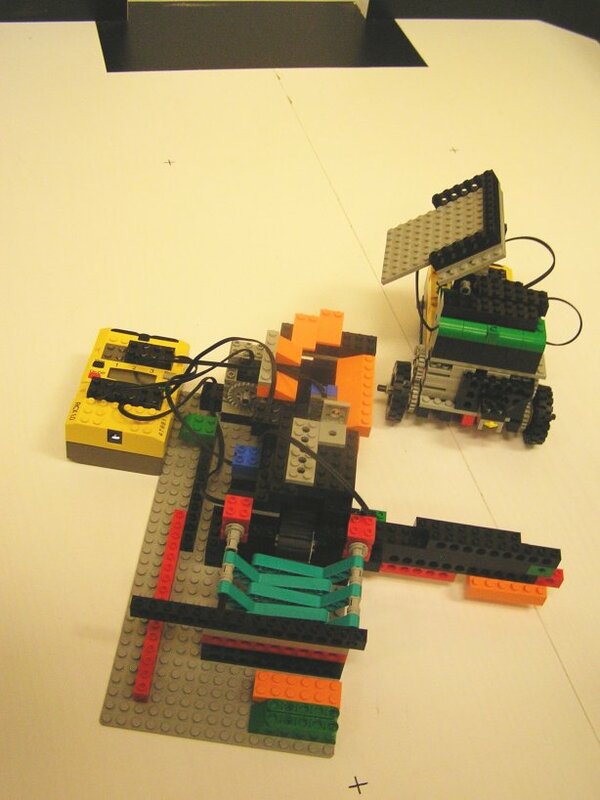 Let's see if any robots will dance 'odzemok' next time...? The classical Rescue category was attended by 10 competing teams. 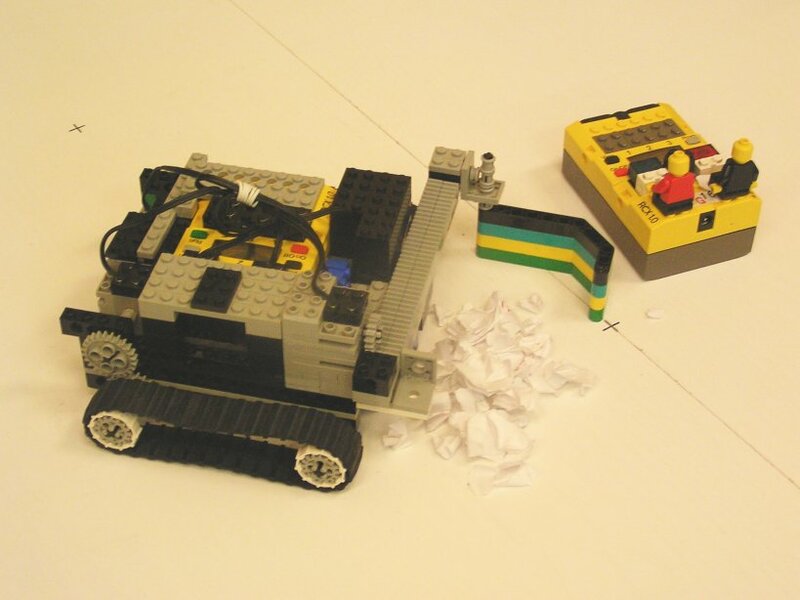 The news for this year were the penalty points subtracted for touching the robot (-5 points), and for locating victims at the locations where they are not (-2 points). The victims (standardized stickers) were also somewhat treacherous as they intersected the line several times! The obstacle was successfully negotiated in at least one of the two runs by more than half of the teams. The shortest time was achieved by Banská Bystrica 1, but the first criteria was the number of points. Largest possible number of points (150) was acquired by two teams ZŠ Dlhá nad Oravou (primary) with time 1:54 and Banská Bystrica 2 (secondary) with time 2:06. We thank the teachers and organizers for the photographs. We will be gald if you send us link or files with more photos or videos. Congratulations to the winners, and thanks to all participants. You all made a little big step for the future of robotics. Good luck in the future! 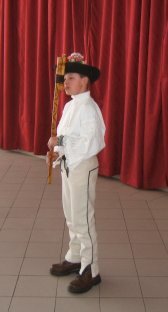 The arrangement in Stará Turá showed that many schools in Slovakia (particpated: Gymn. Martina Hatalu Trstená, ZŠ Prievidza , ZŠ Spišský Hrhov, ZŠ Pusté Úlany, ŠVS Banská Bystrica, ZŠ Štrba, ZŠ Šintava, ZŠ Rudolfa Dilonga Trstená, ZS Krajné, ZŠ Liptovský Hrádok, ZŠ Dlhá nad Oravou, ZŠ Chlebnice, ZŠ Slov.partizánov Pov. Bystrica, Amavetklub 547 Považská Bystrica, ZŠ sv.Jana Bosca Nová Dubnica, Gym. Alejová Košice, Piaristicické gymn. 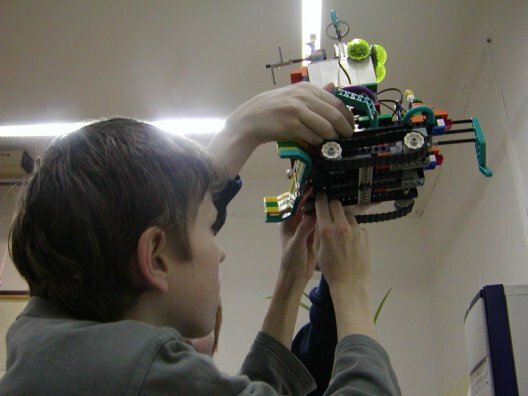 Nitra, Gymn.Pov.Bystrica a ZŠ Nová Dubnica Hviezdoslavova) have the LEGO sets for good reasons and the motivated, enthusiastic teachers who use their free time for the benefit of the children still do exist despite the fact that they are rewarded by quater of what they deserve). Many thanks to them for that and best wishes in the future in leading the school clubs, in daily education, and in preparing the students for future contests. If you have a video or photos from the contest, or other materials - send them to us, we will be happy to publish them here.